Sue Denim may be one half of the electro-duo ‘Robots in Disguise’, but she’s also a talented solo musician in her own right. 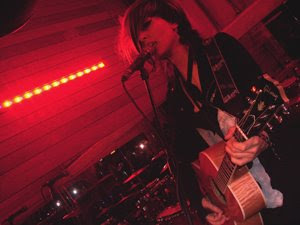 Abandoning the catchy synth riffs and driven baselines that are synonymous with the Robots’ music, she takes to the stage with just an acoustic guitar, her unmistakably brilliant voice, and her iconic fringe. The first words she uttered upon coming on stage were “Oh, we need a set list”. She promptly disappeared backstage and returned with a piece of paper, covered in song names scrawled in black felt tip. This really set the tone of the evening; it was informal and casual, as if she was playing to a room of friends rather than a crowd of anonymous fans. Sue was joined onstage by ‘Oscar’, who was wearing what can only be described as a roll-neck catsuit; he went on to provide Sue with accompanying guitar parts and backing vocals. The performance benefited from the addition of an extra musician; all playing in perfect unison, with stunning vocal harmonies and contrasting guitar parts that couldn’t have been played by a solo musician. Oscar’s most notable contributions were the complementing instrumentals in ‘We don’t want to leave Eden’, and the addition of a second voice in ‘F) I have a girlfriend’, turning the humourous narrative into a duet. The gig was an intimate affair. The venue was tiny, and with no barrier between the audience and the small raised platform that was the stage, tonight’s punters leant on the speakers and got to appreciate the performance from close range. 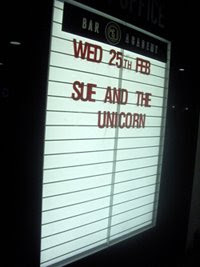 The audience was mainly skinny-jeaned, fringed and proudly sporting their tatty divine ‘robot’ necklaces, the mood relaxed and casual, with Pierre the stuffed-toy unicorn, later renamed ‘The devil’ by Sue, resting on the speakers at the edge of the stage. The songs were punctuated by amicable banter with the audience, further reinforcing the friendly and personal atmosphere. The set ended with a performance of ‘Pick me up’, with members of the audience and the support bands filling the stage, and providing enthusiastic backing vocals. About fifteen minutes after the set finished, Sue emerged from backstage, and graciously interacted with fans that had been waiting to meet her. She patiently posed for photos, signed tickets and proved herself not only to be a talented musician, but also a genuinely warm and friendly person. ‘Sue and the Unicorn’ may just be a singer and her guitar (and some occasional extras), but she has the power to captivate audiences and provide a memorable and unique evening.